First look at two refreshed Audi models. 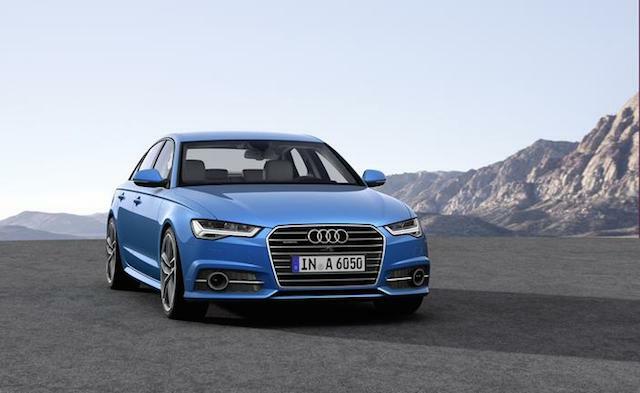 Front view, 2016 Audi A6. There once was a time that car manufacturers would keep new product tightly under wraps until a big reveal such as at an important auto show. In recent years, manufacturers have been sending teaser shots out and in some cases revealing full products ahead of these shows. Credit or blame the Internet with the change as anticipated news stories are often leaked anyway. As for German luxury make Audi, that means showing new 2016 A6 and A7 models a week ahead of the Los Angeles Auto Show where both models will formally be introduced next week. Rear view, 2016 Audi A6. Both models will receive upgraded designs, new technologies and more powerful engines beginning with the 2016 model year. The refresh brings in what Audi says is an “athletic, taut design” supplemented by new headlights, infotainment systems as well as higher levels of luxury and refinement. Both sedans will receive new front and rear designs, including new LED headlights, a single frame grille and bumpers. To the rear LED taillights and new trapezoidal tail pipes will be present. Inside, the sedans will have a broader selection of design combinations. For example, a new Arras red design choice brings in carbon fiber inserts and red-threaded stitching within. Ventilated seats with massage functionality is also new. Front view, 2016 Audi A7. Under the hood the Audi A6 will continue to offer a pair of turbocharged gasoline engines displacing at 2.0 and 3.0 liters each. A 3.0-liter turbodiesel engine returns. The new base engine is rated at 252 horsepower and 273 foot-pounds of torque. It is available in front-wheel-drive with a seven-speed dual clutch transmission. An eight-speed automatic Tiptronic transmission is standard with the quattro edition. The turbocharged V-6 gasoline engine is now rated at 333 horsepower and 325 foot-pounds of torque and paired with the Tiptronic transmission. The turbocharged diesel will make 240 horsepower and 428 foot-pounds of torque. It, too, is paired with a Tiptronic transmission. Rear view, 2016 Audi A7. 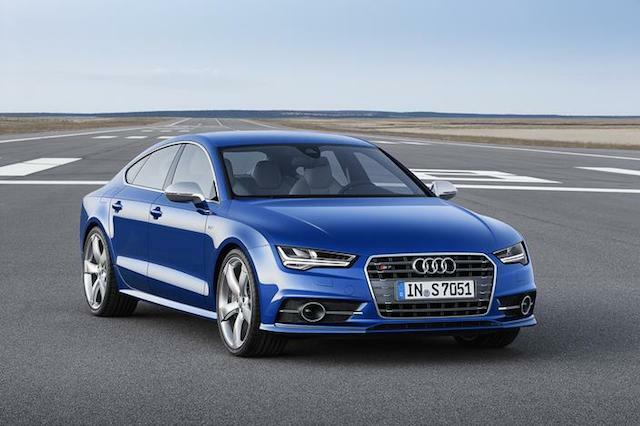 For 2016, The Audi S6 will return making 450 horsepower and 406 foot-pounds torque. Permanent all-wheel-drive is standard. 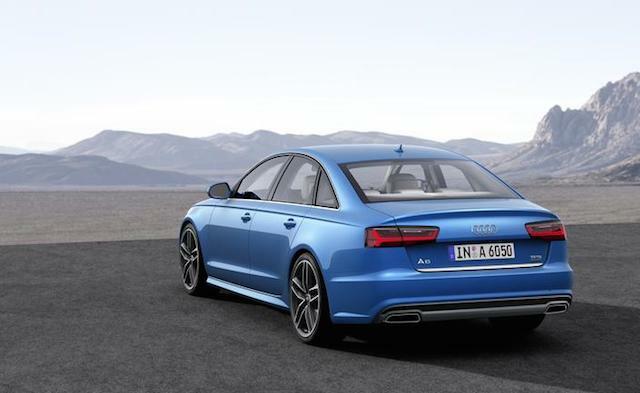 The Audi S6 as well as the S7 will also offer an available sport exhaust system with black oval tailpipes. 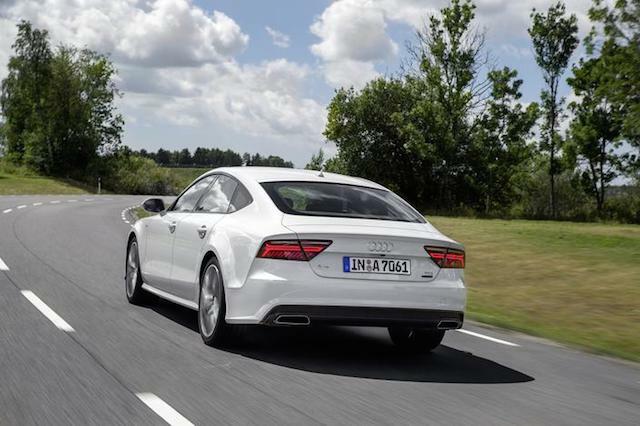 Choose the Audi A7 and both gasoline and diesel engines displacing at 3.0 liters will be available. An RS 7 variant will also be sold, making a whopping 560 horsepower and 516 foot-pounds of torque. Both sedans will now incorporate start-stop technologies. The Audi A7 will also receive LED headlights; both models will offer various safety technologies including Audi Side Assist, Active Lane Assist and Secondary Collision Assist. Improvements have also been made to the available night vision system and to the head-up display. Audi will also upgrade its infotainment package to include Internet access by means of 4G LTE and integrated hot spot, allowing for as many as eight devices to connect simultaneously. Internet radio streaming, online traffic information and Siri Eyes Free integration are among the other improvements made. Audi will debut both models at the Los Angeles Convention Center at 9 a.m. on Wednesday, Nov. 19. The Audi TT will also makes its US debut at the auto show. Photos courtesy of Audi of America.